Electric servo motor handbrake epb brake calliper set repair kit for. This product page has been automatically translated. If you have any questions, do not hesitate to contact us. 1 x trigger set of 1 x, 2 x 9 pcs fastening screws. 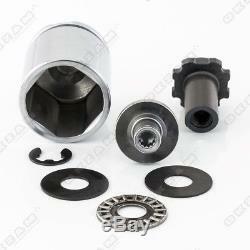 Repair kit, grease, 1 piston x. Dimensions: 84 x 143 x 103 mm. Torque power: 15.5 nm / 17a. This version is equipped with a 12-page torx (fluted). Only for vehicles up to model year 2012. Warning: why we used two different end variants of the servomotor. This is the first / previous version. Compare please reference to the teeth (torx)! We also offer the option of having a 6-page torx. After installation please start the engine and apply the parking brake. The servomotor starts several times to open and close. Thus, the parking brake is set. Add our shop to your favorites so that you will be informed in the future always in time about special promotions in our shop. Our transportation and logistics partners. Parking brake repair kit caliper brake epb kit for audi q5 8r. 8 k 0998281, 32335478, 3d 0698671, 4e0615137. Dimensions: 84 x 143 x 103 mm torque power: 15.5 nm / 17a this version is equipped with a 12-page torx (fluted). Important note: after installation please start the engine and apply the parking brake. Compatible with the following models. 1968 ccm, 100 kw, 136 hp. 1968 cc, 105 kw 143 hp. 1968 ccm, 120 kw, 163 ch. 1968 ccm, 125 kw, 170 hp. 1968 cc, 130 kw 177 hp. 2.0 tfsi hybrid quattro. 1984 ccm, 155 kw, 211 ch. 1984 ccm, 132 kw, 180 ch. 1984 cc, 165 kw, 224 hp. 2967 ccm, 155 kw, 211 ch. 2967 ccm, 176 kw, 240 hp. 2967 cc, 180 kw, 245 hp. 2967 cc, 184 kw, 250 hp. 2995 cc, 200 kw, 272 hp. 199 kw, 3197 cc, 270 hp. 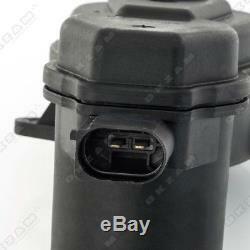 Servo motor for epb handbrake caliper for audi a4 b8 - torx 6. Dimensions: 84 x 143 x 103 mm torque power: 15.5 nm / 17a this version is equipped with a 6 torx pages. Only for vehicles up to model year 2013. We also offer the possibility of having a 12-page torx (fluted). Servomotor for epb handbrake caliper for audi a5 8 t 8f - torx 6. Servomotor for epb handbrake caliper for audi q5 8r - torx 6. Servo motor brake caliper brake for mercedes w176 w246 c117 - torx 6. Servo motor brake caliper brake for mercedes w166 r231 r172 - torx 6. Servomotor for epb brake caliper for audi a5 8 t 8f - torx-page 12. Servomotor for epb caliper handbrake for audi a4 b8 - 12 pages new torx. Servomotor for epb brake caliper for audi q5 8r - torx 12 new pages. Servo motor brake caliper brake for mercedes w176 w246 c117 - torx-page 12. Servo x 2 motor for brake caliper epb for audi q5 8r - torx-page 12. 2 x servo motor brake caliper epb for audi a5 8t 8f - torx-page 12. 2xstellmotor brake caliper for mercedes w176 w246 c117 torx 12 pages. 2xstellmotor brake caliper for mercedes w166 r231 r172 from torx 12 pages. Torx screw 6 adapter for servo automobile parking brake epb for laudi q3 8u. Dimensions: 68mm x 29mm this version is for the 6 torx pages. Warning: why we used two different end variants. We also offer the option for a 12-page torx (fluted). Torx adapter screw 6 faces for servo handbremse epb for seat alhambra. Torx adapter screw 6 faces for servo handbremse epb for vw 3c. Only for vehicles up to the 2009 model year. 6-sided torx adapter screw for handbremse epb servomotor for vw sharan 7n. Torx adapter screw 6 faces for handbremse epb servomotor for 5n vw tiguan. 2 x Torx screw adapter 6 for parking servo motor epb brake for audi q3 8u. 2x torx adapter 6-sided for stellmotor handbrake epb for vw passat. 2x adapter screw 6 sided torx stellmotor handbrake epb for seat alhambra. 2x torx adapter 6-sided for epb stellmotor hand brake for vw sharan. Torx 12-pin adapter screw for handbremse epb servomotors for audi q3 / r8. Dimensions: 68mm x 29mm this version is for 12 pages torx (fluted). We also offer the option for 6 torx pages. 12-page torx adapter screw for handbremse epb servo motors for vw. Screws of the 12-page Torx servo motor adapter handbremse epb for seat alhambra. 12-page torx adapter screw for handbremse epb servo drives for vw sharan 7n. Screws of the 12-page Torx adapter for handbremse epb servomotors for 5n vw tiguan. 2x fit screw 12 side torx stellmotor handbrake epb for audi q3 / r8. 2x fit screw 12 side torx stellmotor handbrake epb for seat alhambra. Brake caliper servo motor epb handbrake for audi a5 8t 8f electric parking brake. Brake caliper servo motor epb handbrake for audi q5 8r electric parking brake. Brake caliper servo brake handbrake epb for class of mercedes a b cla. Servo motor parking brake epb caliper handbrake for mercedes class slk m. 2 x brake clamp servo motor electr. Parking brake handbrake epb for audi a4 8 k b8. Parking brake handbrake epb for audi a5 8 t 8f. Parking brake handbrake epb for audi q5 8r. 2 x clamp brake motor servo brake handbrake epb for mercedes a b class cla. 2 x servo motor brake epb brake caliper hand brake for mercedes m class sl slk. Motor servo electric parking brake repair kit caliper brake epb kit for audi a4 8k b8. Electric brake servo motor repair kit caliper brake epb kit for audi a5 8t 8f. Repair Kit brake brake parking kit for class b a cla. Repair kit caliper brake parking kit for m-class sl slk. Actuator of x 2 electr. Repair kit caliper brake parking kit for audi a4 8k b8. Parking repair kit with brake caliper kit for audi a5 8t 8f. Parking repair kit with brake caliper kit for audi q5 8r. Servo motor electric brake parking brake 2 x kit repair kit for class a b cla. Parking brake caliper repair kit for m-class sl slk. Dimensions: 84 x 143 x 103 mm torque power: 15.5 nm / 17a 38 mm on ø pistons: this version is equipped with a 12-page torx (fluted). Parking brake caliper repair kit for class a b cla. Servo motor brake parking brake electric brake epb 2 x kit repair kit for audi q5 8r. Servo motor electric brake parking brake 2 x repair kit for class a b cla. Parking brake brake caliper repair kit for class a b cla. Brake caliper repair kit, brake, hand brake, for m-class sl skl. 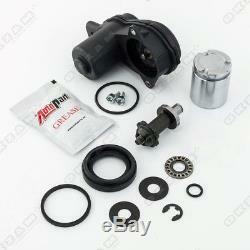 Repair kit brake caliper kit for audi a4 8k b8. Kit kit for audi a5 8t 8f repair brake caliper. Repair kit brake caliper kit for audi q5 8r. Brake caliper repair kit for class a b cla. Repair kit brake caliper for m-class sl slk. Parking brake brake caliper repair kit for audi a5 8 t 8f. Parking brake caliper brake caliper repair kit for audi a4 8 k b8. Parking brake brake caliper repair kit for audi q5 8r. Servo motor electric brake parking brake brake epb 2 x repair kit for class a b cla. Repair kit brake caliper set kit seals drain 6 torx for vw passat sharan tiguan. This version is for the torx 6-seitigen. We also offer the variant for the torx of 12 pages (fluted). Repair kit brake caliper set kit seals drain 6 torx for audi r8, q5 8r / q3 8u. Brake caliper repair kit gasket set set adapter 6 torx for mercedes-benz. Brake caliper repair kit gasket set set adapter 6 torx for seat alhambra 710. Repair kit brake caliper set kit seals drain 6 torx for audi a4 b8 a6 c6 a5 8t 8f. Repair kit brake caliper set kit seals drain 12 torx for audi a4 b8 a5 8 t a6 c6. This version is for the 12-page torx. 38 mm on the ø pistons: warning: why we used two different end variants. We also offer the variant for the torx 6-seitigen (fluted). Brake caliper repair kit set 12 torx drain set for vw passat tiguan sharan. Repair kit brake caliper set kit seals drain 12 torx for seat alhambra 710. Brake caliper repair kit gasket set set adapter 12 torx for mercedes-benz. 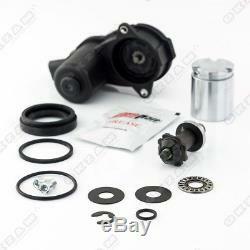 Repair kit brake caliper kit 43 mm rear piston kit for audi a4 8 k b8. Piston / piston ø: 43 mm this version is equipped with a 6-page torx. Set of repair kit caliper brake kit piston kit 43 mm rear for audi a5 8 t 8f. Set of repair kit caliper brake kit 43mm rear piston kit for audi q5 8r. Set of repair kit brake caliper piston 43 mm for mercedes a b class cla. Ersatz, ersatzteil, austausch, repair, kit, spare. Part, replacement, repaiar, auto, automobil, kfz. The item "electric servomotor handbrake epb brake caliper set repair kit for" is on sale since Wednesday, August 22, 2018. It is in the category "auto, motorcycle parts, accessories \ auto \ parts \ brakes \ brake caliper" . The seller is "autoteile-okzam" and is located at 84085.